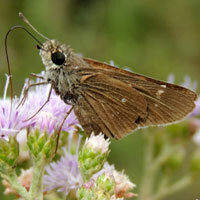 Skippers have clubs at antennae tips but also a small hooked appendage off the club. 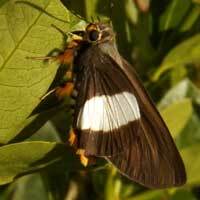 Robust skipper with golden brown legs and dark brown wings. 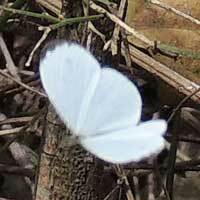 White spot is on underside of hindwing. Common and widespread. 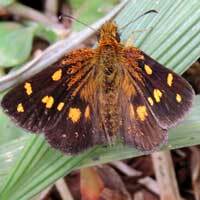 A dark brown skipper with lighter maculations. 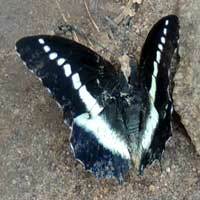 Perches in open with wings held flat. Hooked antennae. 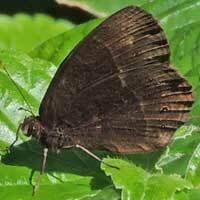 A charcoal-colored skipper. 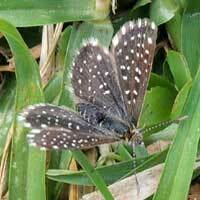 Perches in open with wings held flat. Hooked antennae. Same species as the one to left? 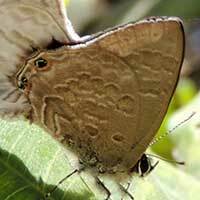 Several shades of felty gray make for a handsome butterfly at Kakamega Forest. View of reverse side shows a few small white spots. Tierra brown. 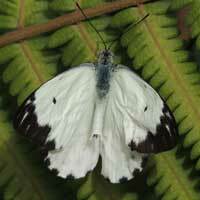 The image shows the underside of wings with a large, bright, silvery-white spot. Remainder brown and gray. 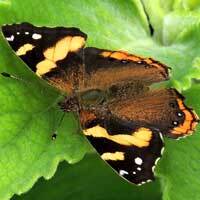 Golden orange spots on a rich brown background. Wingspan is about 17mm. 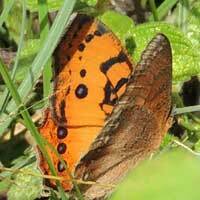 With even more brilliant golden orange spots on a rusty brown background. 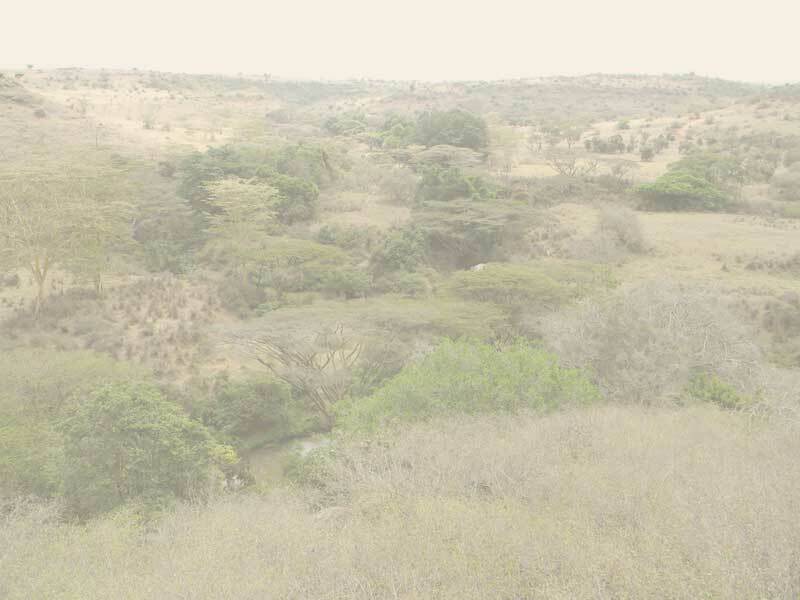 Kakamega Forest. Wing span of about 6 cm with gold, blue and black. Alights on forest pathes. 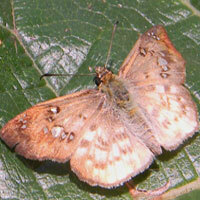 Underside almost uniform brown. Lower elevations. Central disc is bright, brick red surrounded with a black border. Within the black border are smaller white spots. Variable. 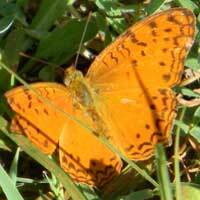 This Euphaedra was flying in close proximity to the Orange Forester (left). The species are polymorphic and very confusing! Sexes are dimorphic. 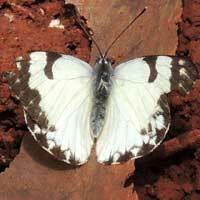 The male of this species has dorsum mostly cream color. 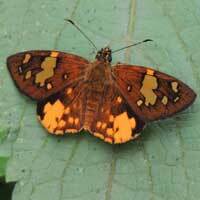 Medium-sized butterfly with dark chocolate brown disc encurcled by two shades of yellow-orange bands. Wingspan about 5 cm. 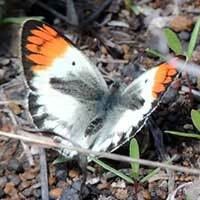 Medium-sized butterfly marked with concentric blue, orange and white on a dark background. 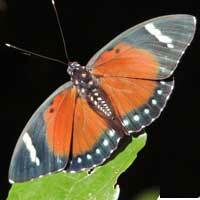 This is the bright orange seasonal form of the butterfly to the left, i.e. they are the same species! 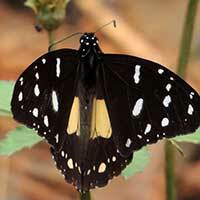 Cosmopolitan butterfly largely orange-brown with markings in black, pink, and white. 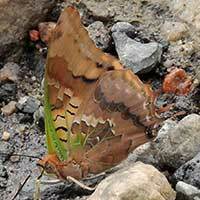 Eye spots on undersides of wings. 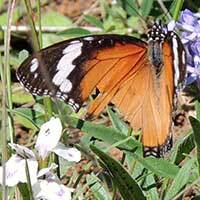 Darker orange bands along the hind wing margins and lighter orange across the forewings.. 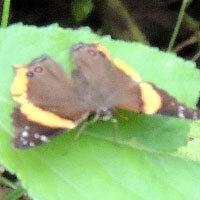 Similar to the Red Admiral, but yellow border extends to the hind wings where small eye-spots are visible near the posterior margin. 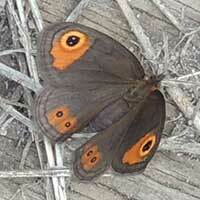 Rather small brush-footed butterfly; wings bordered brown and bright orange around center disc. 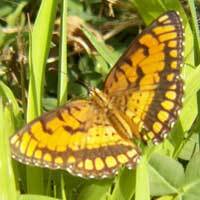 Butterfly of mountain meadows and trails. Golden yellow-brown with black markings. 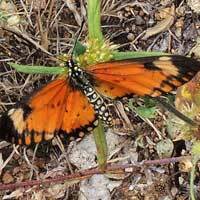 Wing span of about 5 cm of bright orange marked with black spots and filigree border. Common and widespread. Bright, burnt orange with numerous faint darker chevrons. Frequently alights on ground in sunny patches. Wing pattern of yellow and dark brown. 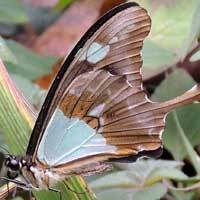 A pair of bright blue spots on hindwings can be more or less hidden. 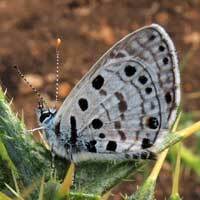 Large blue spots in centers of hindwings on dark brown background. Frequent at flowers. Rich gray-brown and reddish brown in concentric bands. Also a band of small eyespots all around. Alights often on ground. Yellow or pale yellow bands on a background of dark brown. 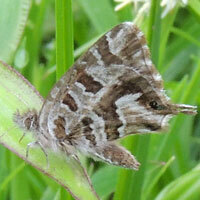 Small eyespots along hind wing margin. Base color is rich brown. 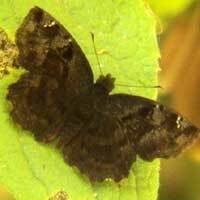 Small eyespots along margin of hindwing. Four wings marked with red and white. Wingspan about 5 cm. Narrow, almost black border all around a central area of yellow and rusty brown. Medium sized, wingspan almost 3.5 cm. 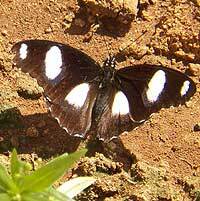 Medium-sized butterfly with wing span of about 5 cm. Boldly spotted with black and orange. 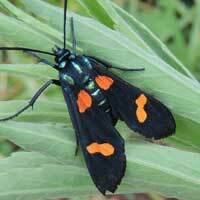 So called because it frequents the open ground along forest pathways. Wingspan about 30 mm. Background is nearly black upon which are bold, white patches. 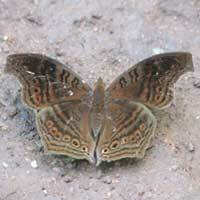 Small, less than 7 cm wingspan, flying in open woodland. 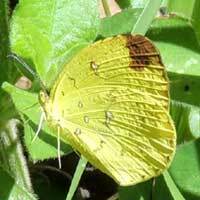 Part of a mimicry complex - but notice the squared tip of forewing. 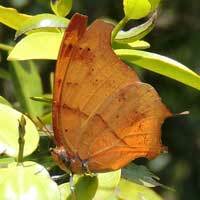 Golden bronze hindwings. 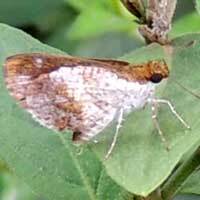 Looks similar to the Diadem, but notice the bent antennae and rows of pale spots along hindwing margins. 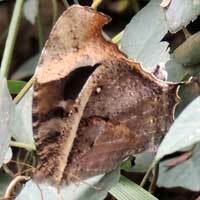 When perched the dorsal pattern is concealed and only a dead leaf pattern is revealed. 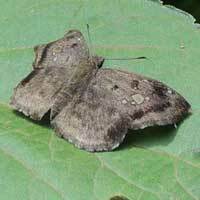 Two short tails on hindwings. 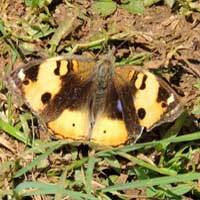 Faint markings on rich golden brown, a bit paler below than above. 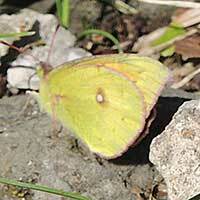 Lime-green highlights on leading edge of forewings. 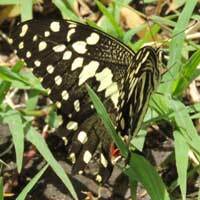 Comes often to damp soil during dry season. Powerful flier. 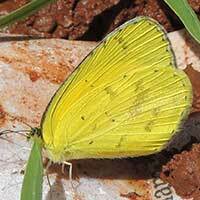 Upper wing surfaces are dark brown with broad swatches of pale yellow. 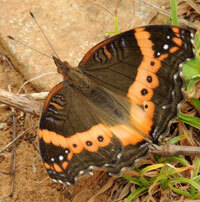 Underside has an intricate pattern of red, white, black and burnt orange. 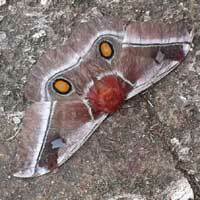 Bright orange-red eye patches in forewings and hindwings. Flits about close to ground. 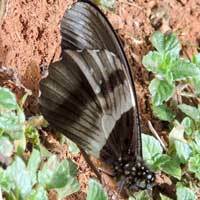 Thanks to the community of photographers on Flickr.com I now have an accurate identification of this leaf-disguised butterfly. Upper surface nearly uniform brown. Some species with eyespots. 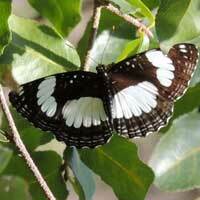 Tends to fly in shady areas below trees. Does not visit flowers. 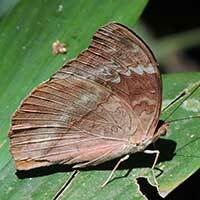 In this species even the undersurface is nearly uniform brown, with only faint markings. Flies among shadows in forest. The color and shading of a dead leaf. Flies close to ground and lands below trees with more dead leaves. 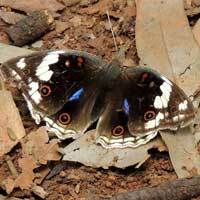 These butterflies keep to shady, dappled light areas along forest paths. 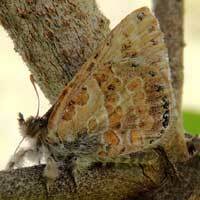 Series of eyespots on underwings. 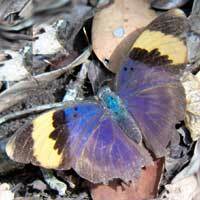 Widespread tropical butterfly with several very different color patterns. This is a common male pattern. 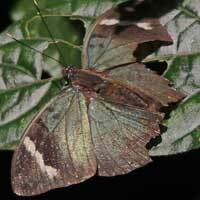 Widespread tropical butterfly with several very different color patterns. This is a common female pattern. The dosal wing surfaces are boldly marked with black, white and beige. The underside here is much subdued. Languid flight. 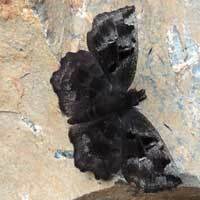 This one is drably colored, black, white, gray and transparent wings. Distinct black spots in white areas. Top surface is mostly orange with back around borders. Slow flight and leathery body. 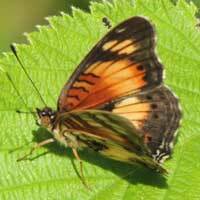 Müllerian mimic of Amauris butterflies. 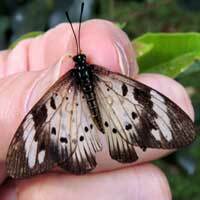 Semi-transparent spots in forewings. There are many kinds of blues mostly less than 25 mm across. Top is blue-gray and underside is a chevron pattern of gray and blue. View of underside. 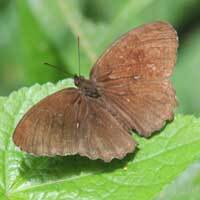 Three short tails on hindwings. Male appears darker than the female. 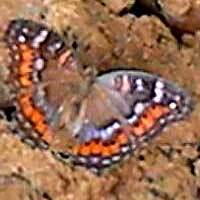 Very small butterfly that stays close to ground level. 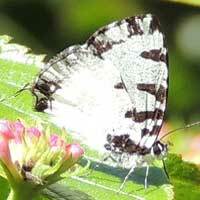 Small white spots on black. Underside is beige. 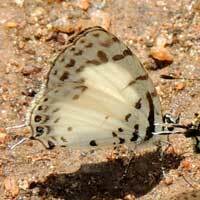 The underside of the wings have an array of black spots on a light gray-blue background. Pied, meaning black-and-white; like India on white linen. 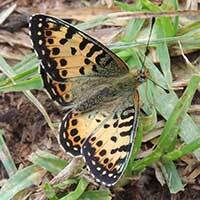 Small butterflies often seen at damp soil on ground. 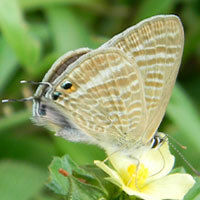 Distinctive Lycaenidae. Underside view. Kitale. Wingspan about 15 mm. 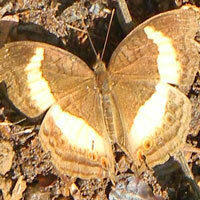 Quite small butterfly with complicated pattern of gray-brown on underside wings. Frequent at moist soil. 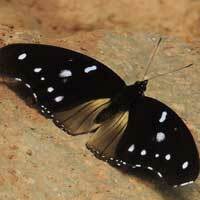 Small butterflies that tend to fly close to the ground with erratic flight. White and gray pattern on underside. < 2 cm. 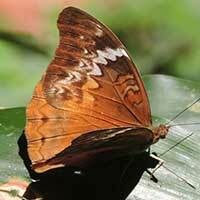 The reverse side of the butterfly has inticate checkers of dark brown on white whereas the top is mostly coppery brown. Small, wingspan about 2cm. 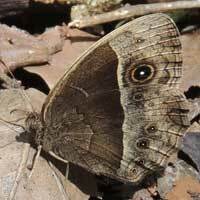 Small butterfly with earth-toned markings and normally not at flowers. Stays near bugs that are prey! 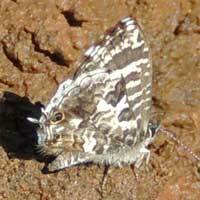 Short tails on hindwing margin. Rows of yellow spots on dark olive-brown. 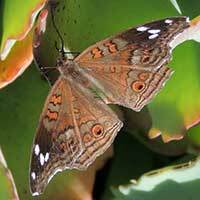 Large butterfly. Large, distinct tails on the posterior margins of the hind wings. Large, quick flier. 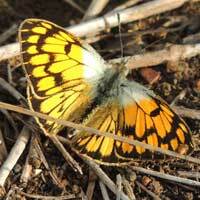 White, yellow and orange butterflies with distinct black dots arrayed along the wing margins. Several species. Wingspan is less than 25 mm. Underside has very faint pattern. Small, wingspan about 2cm. 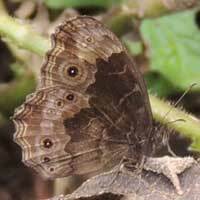 Brown patch at tip of forewing. Kitale. 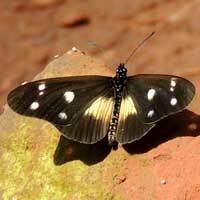 Mostly yellow butterfly with faint pink marins of wings and some dark markings on wing upper surfaces..
White with black lined veins and borders. Seasonal variation in width of black lines and shades of yellow-orange. White with black lined veins and borders. 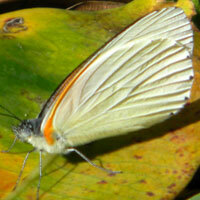 There are several similar species of Belenois. 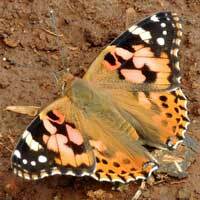 The tip of each forewing is brick-orange. The width of black bands is variable and may be completely absent. Wingspan is less than 40 mm. 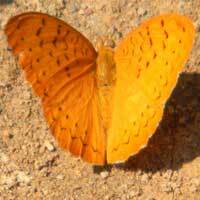 The ground color can vary from dark yellow to golden orange. 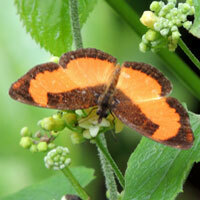 Also called Double-banded Orange. Very eratic floppy flier seen moving close to ground in understory of secondary woods. Small, wingspan < 2 cm. Large moth sometimes at lights. Wingspan 10+ cm. Rich burgandy color. 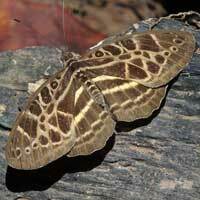 Eyespots on hindwings. Wasps can sting. Moths cannot. 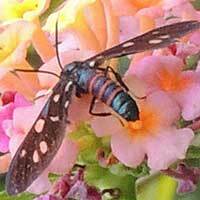 This wasp look alike can visit flowers mostly unmolested. Bright orange marks on irridescent blue-black. 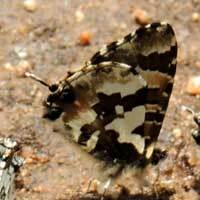 Day-flying moth is probably toxic to birds. 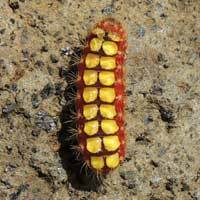 Colorful, often fanciful larvae of a moth - many species and patterns. Stinging hairs make them hazardous to touch! More Amazing Moths - Next Page! Copyright Michael J. Plagens, 2010-2018. By no means am I an expert on the Natural History of Kenya. I am a novice exploring this part of the World. By creating a page for the species as I encounter them I am teaching myself. If I make errors I wish that a kind person will let me know so that I can make corrections.